Stopped in last minute while in HCM City just before they closed. Decided on the Mekong Delta boat tour with stops at the candy factory. What a great experience! My tour guide was Hai, and she was awesome to chat with and was very knowledgable about the history of the area and local HCM City food recommendations. Since this Deluxe Vietnam Tour Company only offers private tours, and I was travling alone, I had my own personal tour guide and river boat all to myself! The tour in Dec 2018 was listed at around $85 USD, but I paid $170. They mentioned it was because I booked so last minute the night before for the morning tour. It could also be since this is a private tour, there may be a 2 person minimum charge? Regardless, it was completely worth it! Nothing quite like having your own tour guide, a river boat all to yourself! It was kinda awkward sitting in a 20 seater with just the tour guide. haha. Saigon or Ho Chi Minh city is the biggest city in Vietnam. 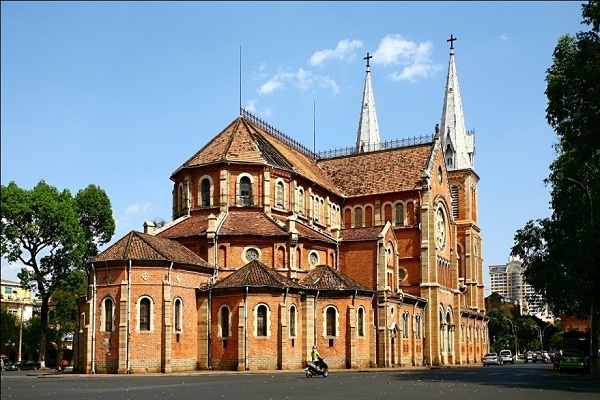 However, you can join Saigon tours for half day to most interesting places such as city centre, China town, Cu Chi tunnels..... or you can customise your Saigon tour package for over one week with amazing lush Mekong delta for exotic cultures of water ways. Unbeliveable, amazing experience on the life of local pepole in Mekong river Vietnam is what tourists say after their trip to Mekong delta. You can join from one day trip to two, three day or even more. Amazing South Vietnam Tours 4 days/3 nights with a perfect combination of typical Asian city life and countryside discovery. It includes the Reunification palace, wonderful architecture of the Mail post building, China town with its colorful pagodas, amazing tunnels in Cu Chi. 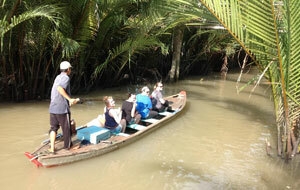 Best of all Saigon tours is Mekong Waterlife. Click the video to see how our client enjoyed South Vietnam tour with us. - Weather: No hot or no cold - Everage 22Co. Near the equator. 2 seasons: Rainy season from May to Nov and dry season from Dec to April. 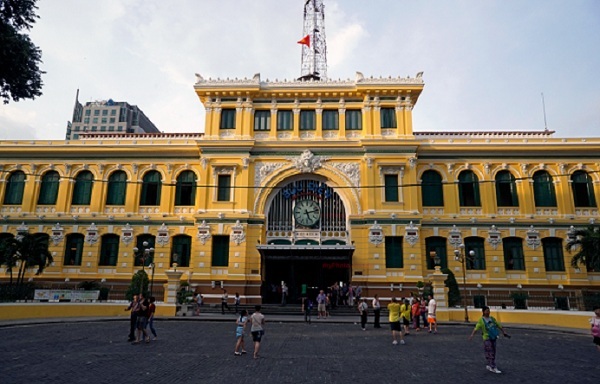 - In 17th century, Saigon was a deserted area with very few people. Most of the local people was Khmer people and some Vietnamese people. - In 1623, the Nguyen lord of Dai Viet(Vietnam) set up the tax-collection station wtih the agreement of the Chan Lap King as there were many boats travelling through this area to Cambodia and Thailand for trading. - 1679 The Nguyen Lord's soldiers stayed in this land. In this year, the Nguyen Lord allowed 3000 Chinese people who supported the Minh dynasty and they were chased by the Thanh Dynasty in China. - 1698 is considered to be the birthday of Saigon with 10 000 people. Nguyen Huu Canh was the leader of Saigon at that time. - In 1802, Nguyen Anh became the King of Vietnam. 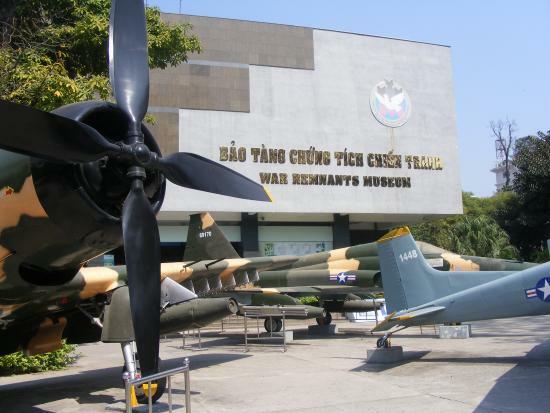 He chose Hue to be the capital and Saigon became the main city in the south of Vietnam. In 1819 Saigon's population is 60.000 people. - On 11-4-1861, the French Set up Saigon city for 500.000 people. - 30 April 1975 Saigon was liberated and unified into Vietnam. - 1976 Saigon was changed into Ho Chi Minh city according the 1st president of Vietnam, but we still call both names. With 320 year old, Saigon is the most busy and biggest centre of economy, trading with foriegn countries. 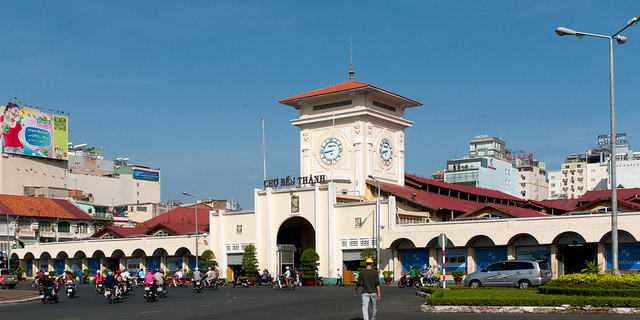 Saigon city has international airport, train station, trading port with Asian countries and the western countries. Saigon is also the most industrial city of Vietnam with the highest population density of Vietnam - 14 million. Sài Gòn has 22 districts 1, 2, 3, 4, 5, 6, 7, 8, 9, 10, 11, 12, Phú Nhuận, Bình Thạnh, Gò Vấp, Tân Bình, Thủ Đức. And suburb districts: Hóc Môn, Củ Chi, Bình Chánh, Nhà Bè, Cần Giờ. Saigon is 2096Km2, so bigger than London, New York, Hong Kong. - 6 bells casted in France and weighted 27 tons. - Located in No 2 Paris Square. - 1868 The French rebuilt this wooden palace by brick palace and it was finished in 1871. The French named this palace as Norodom palace. - 1954 The French left Saigon and the South Goverment of Vietnam wes set up with the help of America. 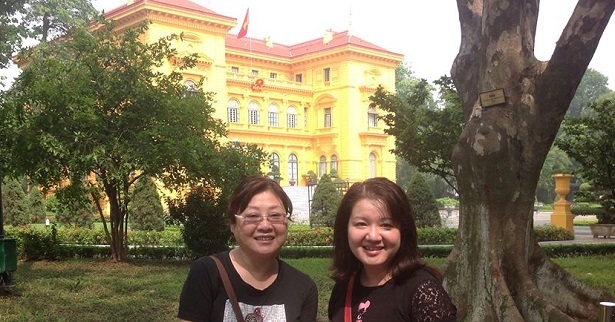 The President of the South Vietnam lived and worked in this palace. 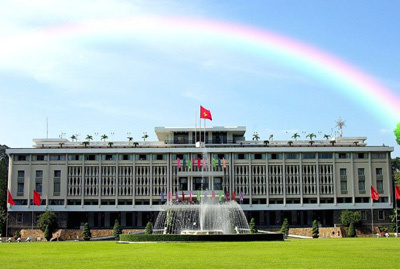 President Ngo Dinh Diem changed the name of the palace into the Reunification palace. - 1962 the uprising party sent the airplane to drop the bomb and distroyed a big part of the palace. - 1963 President Ngo Dinh Diem decided to rebuild the palace. Vietnamese architect - Ngo Viet Thu was chosen to design the palace. While the palace was being built, Ngo Dinh Diem and his bother - Ngo Dinh Nhu were killed in 1963. - 31th Oct 1967, the palace was finished. Nguyen Van Thieu President lived and worked here since Oct 1967 to 21st April 1975. - 3 main levels and 2 underground floor. - During the war against the French( 1945 -1954), Viet Minh troops were hidden in underground shelters in the daytime. They were protected by the local people. The underground shelters were coverd with air circulation with outside so the French troops walked on the ground and could not find Viet Minh troops in the shelters. Night time, Viet Minh troops went out. The disadvantage of the underground shelters is that when the French troops discovered, the Viet Minh troops would be killed. Therefore, the local Vietnamese people thought they had to make the underground shelters longer and into the tunnels. When the French troops discovered the shelter, the Viet Minh troops could go to other places and disappeared. So Cu Chi tunnels were born. 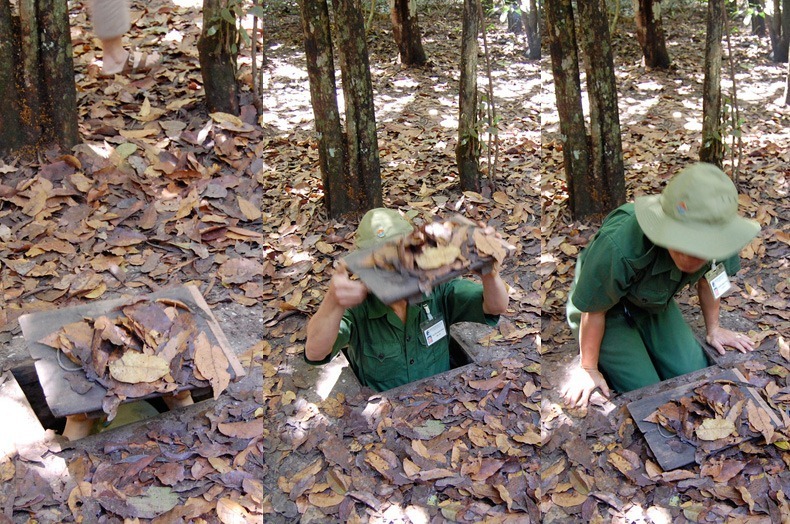 - Cu Chi tunnels were first built in 1948 in 2 communes: Tan Phu Trung and Phuoc Vinh An. At first, the tunnels were simple to hide the documents, weapons and Viet Minh troops. Then, the tunnels were made longer and complicated to link to other communes. - During the war against the American, the tunnels became so complicated and around 250km long. A lot of American troops were sent to Cu Chi district to fight, but the local people in Cu Chi and Vietnamese troops were safe undergroud. At that time, there were many villages underground with meeting rooms, sleeping rooms, movie rooms. The American troops were very afraid of this area as there were so many traps. - Where the big amount of clay was kept when they created the tunnels: It was put in the bombed holes, put on the fields and planted rice, vegetables on the top. The structure of Cu Chi tunnels: Main tunnel with many branches. Also linked to Saigon river, so the locals can go to the river and escape when necessary. 3 levels underground. - 1st level: 3m deep. It is safe with tanks and artillery or cannons. - No other choices, they had to stay in the tunnels to keep them safe. - Over endurance/ sufferance of many local people. - Many people came into and out of the tunnels, they had carefully not destroyed any grass, trees at the gates or the American troops would find them. - Provinces: Can Tho city and 12 provinces: Long An, Tiền Giang, Bến Tre, Vĩnh Long, Trà Vinh, Hậu Giang, Sóc Trăng, Đồng Tháp, An Giang, Kiên Giang, Bạc Liêu and Cà Mau. Seafood - raising area of 71% Vietnam. 54% seafood production of Vietnam. 60% seafood export of Vietnam. However, Very low income with average 2500 USD/person/year 2017. Mekong delta in Vietnam was formed by the clay and sediment from Mekong river. Mekong river comes into Vietnam with 2 branches - Tien river and Hau river. Tien and Hau rivers meet the sea with 9 mouthes. So Vietnamese call the Mekong river Cuu Long river. According to the research in 1961, there was about 4000 billion m3 of water running to the sea. In 1999, there was 160 million ton of sediment and clay came into Vietnam, but 75 million ton of clay and sediment came into the sea in 2015. However, the amount of water and clay decreased as the dams for hydro-power plans in China and Laos - China holds around 23 billion m3 of water and the lakes in the branches in other countries holds around 20 billion m3 of water. Near the nular new year, the need of electric comes down, the Chinese dams hold the water and ther is less water in Mekong river in Vietnam. This caused the drought and sea water came further in land in 2016 and effected 160 000 ha of rice and lost 800 000 tons of rice. 1.5 million people had no income for that time. According the ministry of the environment, about 40% of Vietnam Mekong delta may be under the sea water because of Global warming. Besides this, because of the elnino, many parts of land near the sea got salty water from the sea. If 1m sea water increases, 20% of the Mekong delta will be in sea water. If 2m increases, half of the mekong delta will be in the sea water.